Hi, I'm Ron Hale-Evans, author of the book Mind Performance Hacks and coauthor of Mindhacker. This ever-in-progress blog/wiki is the successor to my ancient and crufty home page, which is out of date in many ways, and no longer represents me or my thinking accurately. Feel free to visit my old pages, which still contain plenty of good stuff (of course, take into account who's telling you that). Ludography: a list of games I've designed or co-designed. I wrote a series of articles on game systems for The Games Journal. There are four articles in the series. I hope to expand them into a book eventually. ReadingPlan: The beginnings of a list of 1000 books I plan to read before I die. 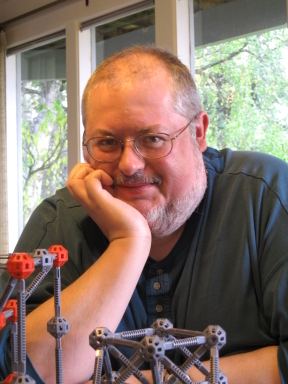 In August 2004, I was a guest of honor at Dragonflight XXV. In April 2007, I was a Nifty Guest at Penguicon 5.0 in Troy, Michigan. I sometimes appear on radio and podcasts in connection with my books and other projects.